The deleterious effects of acidic streamwater are well established, primarily in terms of reduced numbers of species and individuals (Figure 4.8), but there also is evidence of altered ecosystem processes. The degree of acidification is of course very important, and depends upon both inputs and buffering capacity. Organisms evidently are harmed via diverse pathways, including metal toxicity, and taxa differ in their susceptibility. Consequently, while one can assert that anthropogenic acidification is generally harmful once pH falls much below 5.0, the details depend upon many factors. dipterans. Such streams occur in areas of relatively hard, slow-weathering rocks, often in the headwaters. 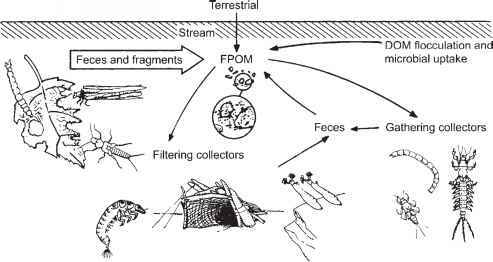 Locations with pH permanently >5.7 have additional taxa, including a number of mayflies, two other species of trichopterans, the limpet Ancylus, and the amphipod Gammarus. They are found in regions of sedimentary slates and exposed veins of calcite. These streams have not changed in acidity since at least the 1950s, evidently because bicarbonate ion availability counters the continued inputs from acid rain. Naturally acid streams seem less affected than those acidified by atmospheric pollutants. 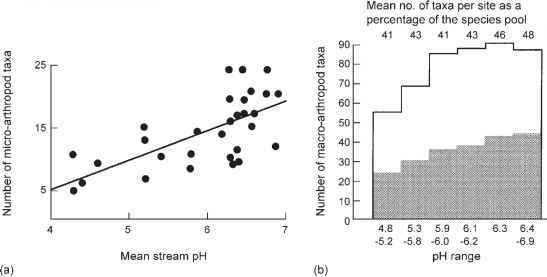 A survey of 34 streams in New Zealand that exhibited a pH range from 4.1 to 8.1 due to variation in natural concentrations of humic substances found no correlation between pH and taxonom-ic diversity (Winterbourn and Collier 1987). Similar numbers of taxa were obtained from streams with pH <5.5, between 5.6 and 6.9, and >7.0. Only at a pH below 4.5 was there any evidence of faunal exclusion, in marked contrast to the Duddon example. These contrasting cases suggest that the mechanism must involve more than acidity alone. 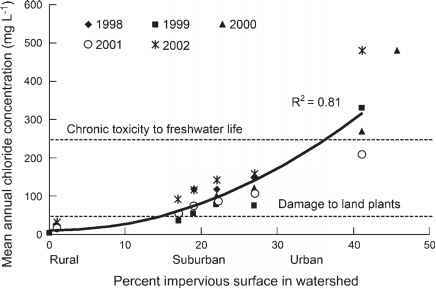 Indeed, there is growing evidence that lowered pH is accompanied by a number of chemical changes, and also that organism response is due to various physiological, behavioral, and indirect effects. Leaching of metals from soils is an important consequence of hydrogen ion deposition. Aluminum occurs in elevated concentrations in acidic waters (Figure 4.9), and is known to impair osmoregulatory processes by damaging the ion-regulating organs. Separate and combined additions of aluminum compounds and inorganic acids to stream channels have been used to distinguish the direct influence of hydrogen ion concentration from the effects of elevated aluminum. In a short-term (24 h) manipulation of a soft-water stream in upland Wales, two salmonid species exhibited far greater susceptibility to the combined effects of acid and aluminum versus sulfuric acid alone, apparently because of respiratory inhibition (Ormerod et al. 1987).